Prior to reviewing this DVD, I have to admit I was unaware of “I’m Dickens…He’s Fenster”. 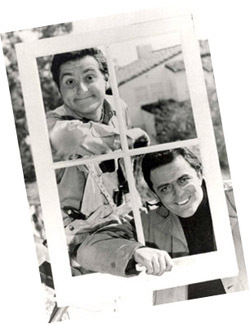 I was though quite aware of John Astin, Marty Ingels and Lee Meriwether. This DVD marks the 50th Anniversary of 1960s TV sitcom and it is also the first time that these episodes have been released on DVD. The release contains a three-disc set which contains over 10 hours of content. It features the first sixteen episodes of thirty-two from the show’s only season. It is very sad that this show only latest one season because it is a riot. It is simple and subtle but extremely funny. The show is created by Leonard Stern who is responsible for hit comedy shows like “The Honeymooners” and “Sergeant Bilko”. I have to certainly thank Glass Onyon PR for allowing us to find this wonderful gem of a show. This DVD is highly recommended…simply wonderful. “I’m Dickens… He’s Fenster” follows Harry (Astin) and Arch (Ingels) and their adventures being best friends and also working together as construction workers. The two are absolutely hilarious and are backed but some amazing guest stars including: Yvonne Craig (Batgirl from “Batman”), Harvey Korman (“The Carol Burnett Show”), Sally Kellerman (“M*A*S*H”), Peter Lupus (“Mission: Impossible”), Lee Meriwether (“The Time Tunnel”), Ellen Burstyn (“The Exorcist”), Edy Williams (“Beyond the Valley of the Dolls”), and Jim Nabors (“The Andy Griffith Show”). The series looks great on DVD and the episodes look sharp and really clear for a show that is 50 years old. It is also presented in full frame with 1.33:1 ratio and original mono audio track. The special features on this DVD release are jam packed. There are all-new interviews including stars John Astin and Marty Ingels, Directors Arthur Hiller, Norman Abbott, and Creator/Producer Leonard Stern. If you are fan of audio commentaries there are bunch feature John Astin and Marty Ingels, Yvonne Craig, Lee Meriwether, Dave Ketchum, Chris Korman (son of Harvey Korman) and creator/producer Leonard Stern. There is a funny featurette called “I’m Dickens…He’s Fenster Get Physical”. There is a very sweet video tribute to the late Leonard Stern. There are three funny featurettes including “The Joke”, “Love Me, Love My Dog” and “How Not to Succeed in Business”. There are old commercials including Bumpers, ABC TV Network Promo and Cast Commercial. Lastly there is a ‘Thank You’ slide show video featuring the dozens of people who helped make the 50th Anniversary Collector’s Edition a reality.